Fort Lauderdale, Florida offers visitors a dazzling array of entertainment and activities, including diving, deep sea fishing, airboat rides across the Everglades, water skiing, kite surfing, canoeing and kayaking. In addition, there are 70 golf courses, hiking trails and 30 parks, nature preserves and wilderness areas to enjoy. Luxurious resorts, hotels and swanky restaurants as well as down-to-earth venues make Fort Lauderdale a great destination for your bachelorette party. In the guide below, we’ll help you get started by explaining how to get there, what to do while you’re there and some good places to stay and eat. Driving to Fort Lauderdale can be a lot of fun if you live within a reasonable distance. Fort Lauderdale is located on the eastern coast of Florida about 30 miles north of Miami as shown below. 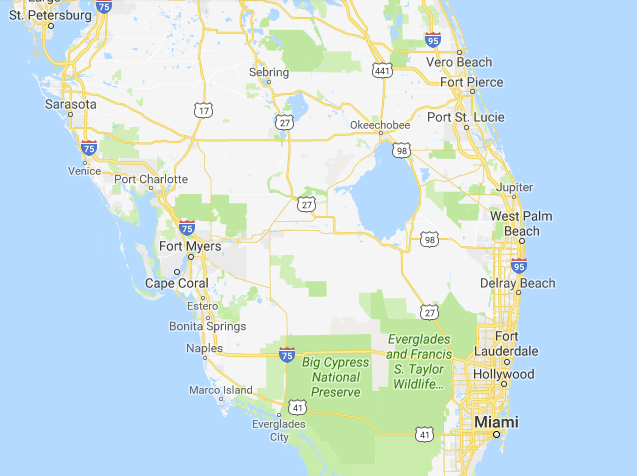 If you’re driving to Fort Lauderdale, you and your friends can enjoy the beautiful Florida coastline on U.S. Route 1 which runs the length of the east coast. 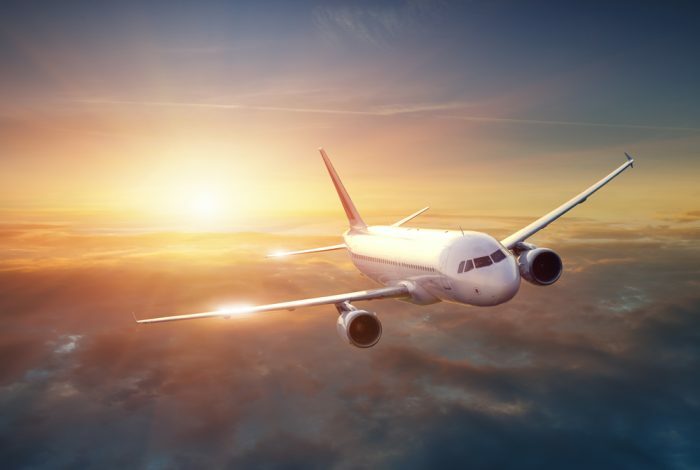 If you plan on flying to Fort Lauderdale, there are several airports that offer domestic and international flights, including those described below. Fort Lauderdale-Hollywood International Airport (airport code FLL). Located at is located at 100 Terminal Drive in Fort Lauderdale, this airport is serviced by Alaska, Allegiant, Bahamsair, Silver, Southwest, Virgin America and Westjet. Miami International Airport (airport code MIA). This is a major international airport that is serviced by all major carriers Miami International Airport is located at 2100 NW 42nd Avenue in Miami. Palm Beach International Airport (airport code PBI) is located at 1000 Palm Beach International Airport in West Palm Beach, about two and a half miles west of downtown West Palm Beach. Like Miami International, this is also a major international airport with three passenger concourses and is serviced by all major carriers. If you’re arriving at Miami International Airport, taxis, shuttles, shared ride services and car rentals from Advantage, Alamo, Avis, Dollar, Enterprise, Thrifty and other national companies are readily available. Taxis, private car/limousine and shared ride services (like Uber – signup with our link for $20 OFF and Lyft) are available also readily available at Fort Lauderdale-Hollywood International Airport and Palm Beach International Airport. If you decide to go with a rental car, always book with rentalcars.com which offers discounts of up to 50% off. Limousine services are available through USA Transportation (800) 458-0500, Enova Transportation (877) 587-7667, Elite South Florida Shuttle, (877) 786-9546, Tri-County airport limo (800) 497-5722, and Limos of South Florida at (800) 901-1644; costs range between $75 and $125. In addition, transportation to the Greater Miami area is provided by Go Airport Shuttle and SuperShuttle and costs around $25 from the Fort Lauderdale-Hollywood International Airport to Fort Lauderdale. The costs for private car and limousine services differ based on whether it is for an individual or shared-ride. 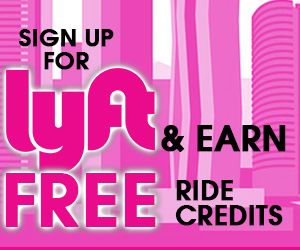 You can also check out limos.com to lock in some additional savings. Pink Hummer Limo. True to its name, this top-rated party bus rental company specializes in bachelorette parties and features a luxurious stretch pink Hummer that can accommodate up to 18 guests. Besides their eye-catching pink Hummer, this company also has larger party buses for groups between 25 and 40 passengers. All of their party buses come with custom lighting and music and are fully stocked with ice, cups and various non-alcoholic beverages. Guests receive free entry to many of the city’s hottest clubs and discounted pool parties at Hyde Beach. Although prices vary depending on the season so be sure to check in advance, a 4-hour cruise around town in their pink Hummer currently costs $500. Fort Lauderdale Party Bus. 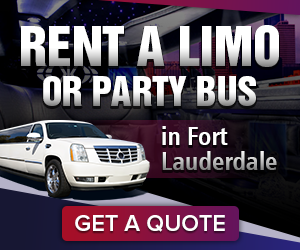 With party buses for groups of 14 to 50 guests, this party bus rental company can provide the perfect vehicle for your bachelorette party in Fort Lauderdale. This company recommends Las Olas Boulevard as one of your destinations along the way since there are abundant shopping opportunities at boutiques and restaurants available as well as a visit to the Living Room Nightclub. If sightseeing is your preference, Fort Lauderdale Party Bus features a tour of the intercostal region popularly known as “The Venice of America.” Their world-class party buses are equipped with fiber-optic lighting, dance poles, wet bars and LCD satellite television. Millionaire’s Concierge. In business for more than 30 years, this yacht charter service specializes in parties and you and your friends will feel like royalty while you enjoy the spectacular views of the Florida coast, skylines, celebrity mansions and historical landmarks. They also provide complete event planning services, and offer a range of food and beverage packages prepared by onboard chefs. In addition, Millionaire’s Concierge provides coach and limousine services and welcomes passengers with a red carpet and champagne. Their state-of-the-art fleet of yachts can accommodate between 20 and 600 guests and cruises typically last between 3 and 6 hours. Party Boat Rental Fort Lauderdale. This party boat rental service is a bring-your-own-bottle affair for up to 12 people with costs ranging from $600 for a 4-hour excursion to $1000 for an 8-hour excursion for up to 12 guests. These costs include fuel, music, an experienced captain as well as ice and water. Looking for a unique bachelorette party idea in Fort Lauderdale? 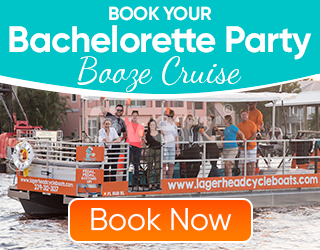 Consider Lagerhead Cycle Boats, which provides everything we love about bike bars and BYOB party boats. 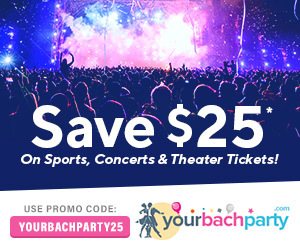 Mention coupon code “yourbachparty” for 10% off your first booking! Throw a beach party on Las Olas Beach. This is an inexpensive way to have fun in the sun, soaking up some rays or body surfing. Be sure to bring plenty of beach and bath towels, an ice cooler and ice, and a portable speaker for your music. Because alcohol is not allowed on the beach, take some vodka and use plastic red cups if you and your friends want to drink booze. This stratagem usually works but you should of course remain vigilant for the constabulary. Beachside bar crawl. Water taxis are available with 15 different stops that allow you to jump off when the mood strikes you but it is easy enough to walk since there are numerous bars along the beach. Seasoned visitors recommend beginning at the Riverwalk stop since this area features a number of bars and restaurants and continuing on to Himmarshee Village and ending up at Las Olas or the Beach Place. Usually held in July, the next date and location for this ultra-fun pool party will be announced soon. Check their Facebook page for updates. The party bikes at Cycle Party seat up to 15 people allow you and your bachelorette party guests to sightsee, bar crawl, or just a foodie tour. Four wheels make the vehicles steady (even if you aren’t) and five passengers get to relax while the other ten do all of the pedaling so be sure to take turns. 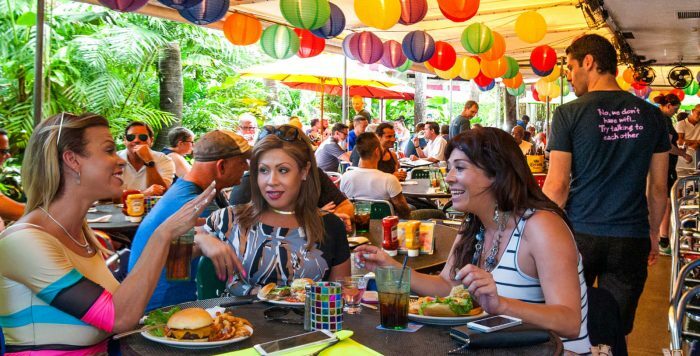 They also feature a 2-hour “Sunday Funday” tour (with or without drinks) the first Sunday of each month (free mimosas and bloody Marys) as well as scavenger hunts that you can complete while you enjoy the sights, smells and sounds of Fort Lauderdale. Cycle Party is a sure-fire way to have a great time and make some lifelong memories. Don’t forget your camera! What better way to relax after a long night of partying that luxuriating in the world-class spa facilities at the Conrad Hotel? The spa features personalized treatments and experiences, massages, facials, body wraps, and exfoliation sessions. They also provide separate women’s and men’s locker rooms and steam rooms as well as rain-bath showers. Treat yourself and your friends right with a day at Conrad Hotel’s fabulous spa and be sure to enjoy their upscale restaurant and lounge. Monday through Wednesday: 7:00 a.m. to 5:00 p.m.
Thursday: 7:00 a.m. to 1:00 a.m.
Friday: 7:00 a.m. to 4:00 a.m.
Saturday: 8:00 p.m. to 4:00 a.m. 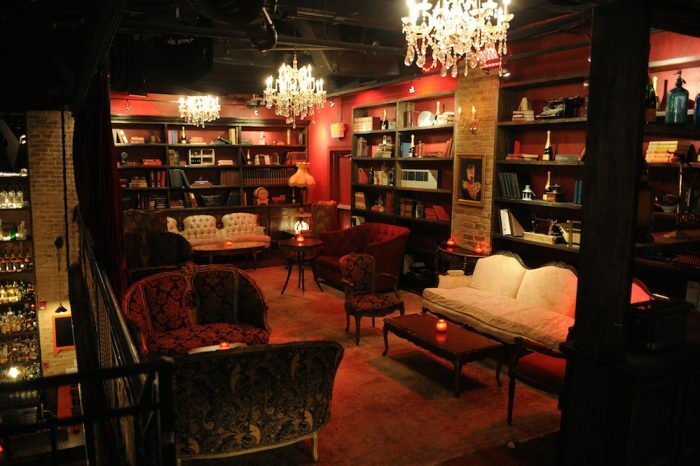 Featuring nostalgic, 1920s speakeasy style décor, this cozy drinking den and coffee bar has two levels and three bars, LED-lit dance floor, gobo lights, interactive entertainment, an elevated stage, DJ music and superb cocktails. Because they also specialize in private parties, this is a perfect destination for your Fort Lauderdale bachelorette party. Wednesday: 5:00 p.m. to 1:00 a.m.
Thursday: 5:00 p.m. to 2:00 a.m.
Friday: 5:00 p.m. to 3:00 a.m.
Saturday: 3:00 p.m. to 3:00 a.m. The casual outdoor backyard garden-type environment features large picnic tables, a vintage Airstream trailer bar, craft beers, handcrafted cocktails and rotating local food trucks. If a more elegant indoor setting is what you had in mind, be certain to visit the Den, their finely appointed lounge that includes DJ music and an eclectic collection of kitchshy thrift store decorations. They also feature a weekly ladies night from 7:00 p.m. to 10:00 p.m.
Monday through Thursday: 2:00 p.m. to 2:00 a.m.
Friday and Saturday: 2:00 p.m. to 3:00 a.m.
Sunday: 4:00 p.m. to 2:00 a.m.
With more than 40 signature martinis, James Bond would be right at home at the Blue Martini. This upscale lounge features a warm and inviting environment, live entertainment and DJ music for dancing each night as well as a selection of fine wines, spirits and finger foods. Rated as one of the ten best nightlife spots by USA Today, the Blue Martini also has a patio bar, stage area and VIP lounge for special gatherings such as bachelorette parties. In addition, a ladies night is held every Wednesday. Daily from 11:00 a.m. to 1:a.m. except Fridays when they close at 2:00 a.m.
A great bar, live bands and DJ dancing make the world-famous Elbo Room a great destination for your Fort Lauderdale bachelorette party. 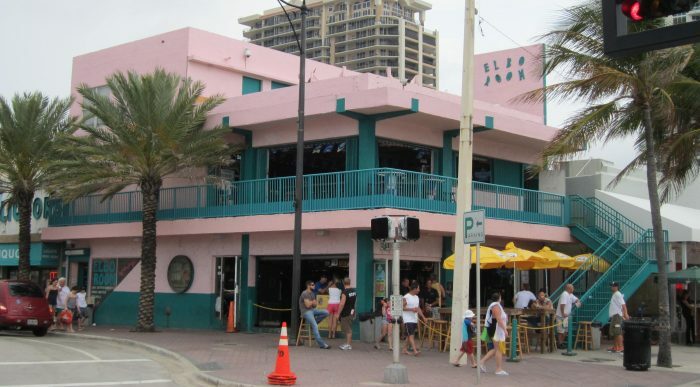 The Elbo Room has been in business since 1938 and is now a Fort Lauderdale landmark. Their Red Monkey beach party attracts the beautiful people every Sunday and you can be sure of having a blast, especially with the city’s best happy hour. Flat screen televisions, a well equipped game room and great pub grub makes this a perfect beachfront destination for your Fort Lauderdale bachelorette party. Be sure to check out their Taco Tuesdays with one dollar tacos! Also, don’t miss their two-for-one deals on mimosas and bloody Marys during their “Hair of the Dog” specials every Saturday and Sunday from 12:00 p.m. to 3:00 p.m. This bar is also a water taxi stop. Open daily 11:a.m. to 4:00 a.m. This multi-level capacious bar features a beachfront patio where you and your friends can take in the view while enjoying DJ music every Thursday through Sunday. Rock Bar also features bar food and a great assortment of cocktails. Don’t miss their two-for-one drink specials and all-day happy hour. This bar is also a water taxi stop. Daily from 8:00 a.m. to 9:00 p.m. This beachside restaurant located at Sun Tower Hotel & Suites features an oceanfront terrace overlooking Fort Lauderdale Beach and, of course, the Atlantic Ocean. You and your bachelorette party guests can lounge on the beach and receive oceanfront service that includes a casual beach menu as well as an assortment of your favorite alcoholic and non-alcoholic beverages. Monday through Thursday: 11:00 a.m. to 12:00 a.m.
Friday and Saturday: 11:00 a.m. to 2:00 a.m.
Monday through Thursday: 11:00 a.m. to 2:00 a.m.
Friday and Saturday: 11:00 a.m. to 3:00 a.m.
Sunday: 11:00 a.m. to 1:00 a.m.
Don’t let their name fool you — the only “bait” at Lulu’s Bait Shack is their 4:00 p.m. to 7:00 p.m. happy hour. They do feature a raw bar, though, and their world famous fishbowl drinks. You and your friends can relax right on the beach surrounded by palm trees and enjoy the view and ocean breezes while you sip your favorite drinks from coconuts. Wednesday through Friday: 8:00 p.m. to 2:00 a.m. This world-class revue show features some of the hottest male strippers in Florida, and they specialize in bachelorette parties. There is no cover charge for the brides to be at bachelorette parties and they even receive a free bottom of house champagne and LeBare tee-shirt. Bachelorette party packages begin at just $185 which includes admission for four guests, a second bottle of house champagne or a round of eight shots, a decorated table for the entire night, a LaBare calendar for each party member and one table side dance and body shot with one of LeBare’s hunky entertainers. Another bachelorette party package is available for $269 that provides free admission for seven guests, a second bottle of house champagne or a round of eight shots, a decorated table for the entire night, a LaBare calendar for each party member, one stage dance from an entertainer and one table side dance and body shot with an entertainer. Finally Lebare VIP package for $499 also provide free admission for seven guests, a bottle of Moet or a bottle of liquor of comparable price, a decorated VIP booth for the night, your choice of a personalized cake or deluxe hors d’oeuvres tray, one stage dance from an entertainer and one table side dance and body shot with an entertainer, a LaBare calendar for each party member. Monday: 6:00 p.m. to 2:00 a.m.
Tuesday through Thursday: 3:00 p.m. to 2:00 a.m.
Friday and Saturday: 3:00 p.m. to 3:00 a.m.
Sunday: 3:00 p.m. to 2:00 a.m.
Thursday, Friday and Saturday: 9:00 p.m. to 11:00 p.m. Featured on “Good Morning America” and in the New York Post, Hunk-o-Mania is the expert when it comes to putting on an exciting 2-hour male revue. Dazzling costumes, acrobatics, comedy and even some romance will make this a high-energy destination that is worth the short drive for your bachelorette party. If you’re in the mood for female performers, Solid Gold is just a quick 18-minute drive from Fort Lauderdale on Interstate 95. This lavish $10 million nightlife venue specializes in private parties and features a rooftop nightclub, spectacular Sky Lounge, the Red Room and Wet Lounge (with private VIP suites) with some of the most drop-dead gorgeous women in Florida. Solid Gold also offers private VIP Jacuzzi suites where as many as ten of their female entertainers will help you relax and melt away your daily stress. Monday through Wednesday: 12:00 p.m. to 6:00 a.m.
Thursday: 12:00 p.m. to 7:00 a.m.
Friday and Saturday: 12:00 p.m. to 8:00 a.m.
Open daily from 11:30 a.m. to 6:00 a.m. This spacious, upscale 14,000 square foot adult entertainment complex features stunning women, six stages on three levels and a full dinner menu. Cheetah also offer a free gourmet lunch from 11:30 a.m. to 3:00 p.m. every day as well as a $6 breakfast menu from midnight until 6:00 a.m. The complex has 40 high-definition televisions located throughout to help you keep track of all of the action, free wi-fi. Moreover, Cheetah specializes in private parties with special deals beginning with their Cheetah Package that includes free admission for five guests, a free liter bottle (excluding super premium brands), free choice of mixers and garnish, a reserved area for 2 hours, and a free cheetah fruit and cheese tray. 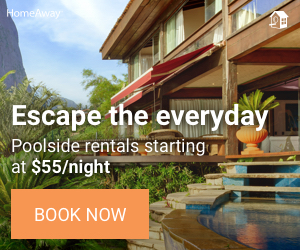 In addition, they offer a Fantasy Package that includes all of these perks as well as free admission for up to 12 guests, two free liter bottles, and a private assigned server. The Ultimate Package provides free admission for up to 20 guests, three free liter bottles, a reserved area for 3 hours and two free Cheetah fruit and cheese trays. Open daily from 7:00 a.m. to 6:00 p.m. except Tuesday when they close at 2:00 p.m. Rated as one of the best places in Fort Lauderdale to enjoy breakfast or brunch, enjoy their omelettes, scrambled eggs, Paris breakfast, eclairs and crêpes. Nanou’s also has delicious quiches, croissants, salads and specialty sandwiches (don’t miss their goat cheese panini!). Breakfast served: Monday – Friday until 10:30 a.m.
Also ranked as one of the best places for breakfast, this is Fort Lauderdale’s first cold pressed juicery + fresh kitchen that features a full menu, cold-pressed juices and mouth-watering smoothies. Mayapapaya also specializes in private parties so you and your bachelorette party guests will be sure to start your day off right. 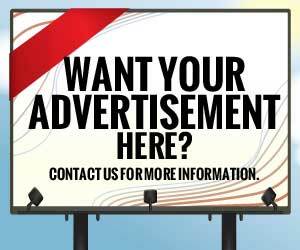 Monday through Friday: 11:30 a.m. to 12:00 a.m.
Saturday: 11:00 a.m. to 12:00 a.m. 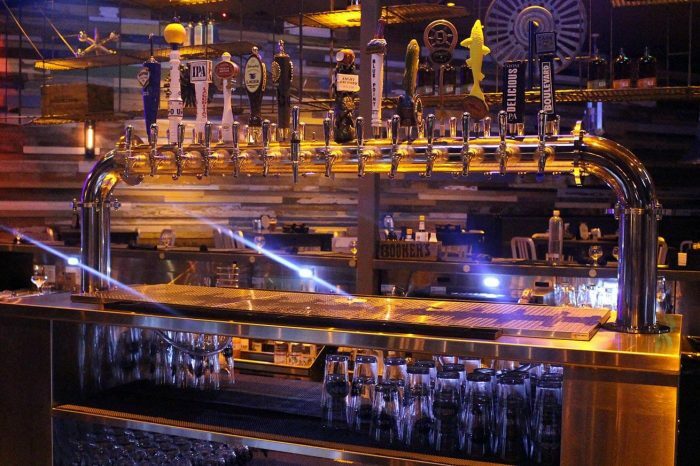 Tap 42 is popular among residents and visitors alike, and features dozens of craft beers on draft as well as creative burgers and handcrafted cocktails. 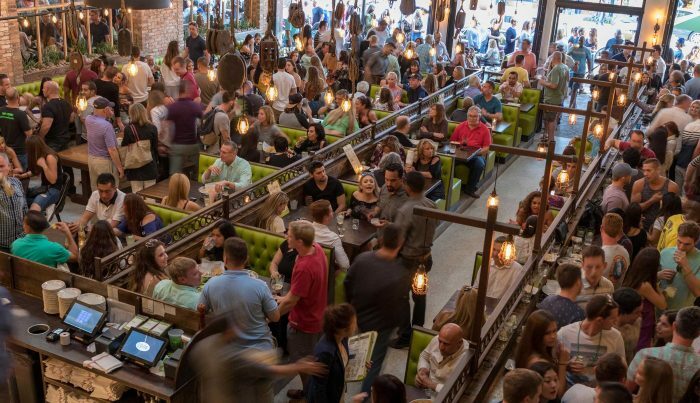 The staff at Tap 42 welcomes private parties but requests that you make reservations at least 72 hours in advance for groups of eight or more guests. Just a 10 minute drive from downtown Fort Lauderdale, Rosie’s is a gay-friendly venue that has something for everyone. Serving brunch and lunch, Rosie has delicious soups (try the French onion) and “Big Girl Burgers” including the “Georgia Bleu” which is topped with caramelized Georgia pecans, crumbled blue cheese and sautéed onions (excuse us while our mouths stop watering). A selection of fine teas, wines and beers is also available. Monday through Thursday: 11:30 a.m. to 1:00 a.m.
Friday: 11:30 a.m. to 2:00 a.m.
Saturday: 10:00 a.m. to 2:00 a.m.
Sunday: 10:00 a.m. to 1:00 a.m. Featuring half-priced drinks and pizzas every day between 4:00 p.m. and 7:00 p.m. every day, Louie Bossi’s also serves pizzas until 1:00 a.m. and their full dinner menu until midnight on Friday and Saturday. Be sure to check out their Martini Mondays with $2.50 sliders and half-priced martinis. Friday: 11:00 a.m. to 3:00 a.m.
Saturday: 10:00 a.m. to 3:00 a.m. Serving up the best Mexican soul food in town with DJ music every day, El Camino has a top-notch tequila bar with tequilas that are not otherwise found outside of Texas as well as early and late-night happy hours. Besides scrumptious burritos, fajitas and tacos, El Camino also features a full dinner menu and daily drink and food specials including Taco Tuesdays and Margarita Mondays. Featuring contemporary American cuisine, Yolo is a longtime Fort Lauderdale tradition – and for good reason. An extensive wine list, inventive cocktails and a sophisticated atmosphere make this an ideal spot for you and your bachelorette party guests. Yolo also has a private dining room and outdoor garden patio that will make your dinner a memorable event. They also offer a virtual tour of the premises so you can start getting hungry right away. Lunch: Daily 11:00 a.m. to 4:00 p.m.
Dinner: Daily 4:00 p.m. to 11:00 p.m. Happy hour Monday through Friday 11:00 a.m. to 6 p.m. Located right on the oceanfront on Fort Lauderdale Beach, Tsukuro features a raw bar and a wide selection of fresh sushi and sashimi. Likewise, wine, sake, tea, and a selection of seasonal seafoods and a good selection of wine, sake, beer, tea, and signature cocktails are available to complement the menu. Tsukuro also specializes in private events for groups of 10 people or more. With 229 hotels and resorts of all sizes and types available, Fort Lauderdale has accommodations to satisfy any taste and budget, including those listed below. Rated as one of the best party hotels in Fort Lauderdale and located on the Intracoastal Waterway, the Hilton Fort Lauderdale Marina is a world-class resort-style hotel situated near many of the city’s most popular attractions including Las Olas Boulevard. 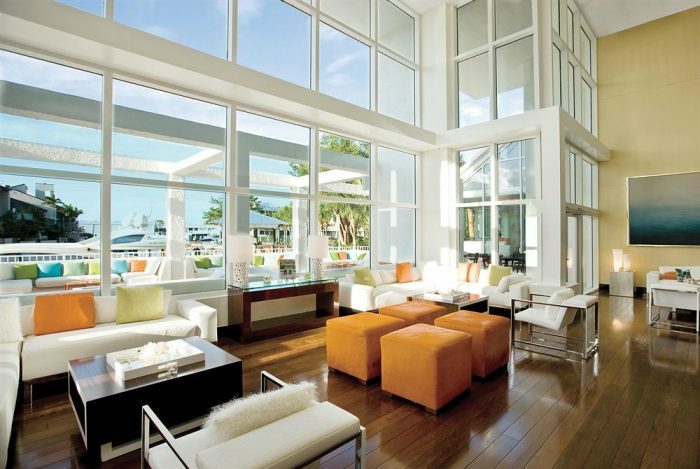 All of their guest rooms feature floor-to-ceiling windows to provide great views of downtown, the Intracoastal Waterway and the busy Fort Lauderdale marine port. This hotel is also a water taxi stop so you and your friends can easily visit great shops, bars and restaurants. The hotel also provides complementary shuttle service to Fort Lauderdale Beach (about 10 miles away) and has free wi-fi service. Also ranked as one of the best party hotels in Fort Lauderdale, Embassy Suites has a free cocktail party with appetizers for its guests every night and free cooked-to-order breakfasts every morning. In addition to a good bar and lounge, Embassy Suites also has an onsite convenience store, spa, gift shop, wi-fi, swimming pool and fitness center. Two-room luxury suites are also available. All-suite private home. This spacious all-suite three bedroom house features three bedrooms (sleeps up to eight guests), a private pool surrounding by a lush backyard space and various high-end amenities for just $258 per night. In addition, the house has a modern full kitchen, laundry facilities, Internet access, satellite television, two balconies, three levels of living space and even a state-of-the-art computerized refrigerator. Private home. This highly rated private updated house comes complete with heated pool and hot tub. The property sports an enclosed, lush jungle-like patio area and a secluded swimming pool. The house also features full laundry facilities, kitchen, and three bedrooms with two king beds, two twin beds and two sofa beds (sleeps up to 10 guests). Enjoy nearby pier fishing, surf fishing or other water sports including jet skis, parasailing and water skiing for only $219 per night. Private home. This sunny Fort Lauderdale home has three bedrooms with comfortable beds and two bathrooms. The house features a fenced in private backyard with palm trees, swimming pool, deck chairs and grill, a full kitchen and dining area as well as free wi-fi access, and four televisions with Netflix subscriptions for only $170 per night. Waterfront home. This exclusive three bedroom Rio Vista waterfront home features a private swimming pool, large covered patio area with a grill, hot tub and great view of the Intracoastal Waterway. The property is surrounded by multi-million dollar ritzy mansions on the Intracoastal Waterway and is regarded as being located on one of the most prestigious streets in the city for just $218 per night. Private home. Described by the owners as a “Tropical Oasis in an Amazing Central Location,” this three bedroom, two bathroom house has a private swimming pool, outdoor grill and deck chairs, laundry facilities, modern kitchen, satellite television and DVD player for just $162 per night. Water sports and numerous popular attractions and entertainment venues are also located nearby. Beach home. You and your bachelorette party friends are just a 2-minute walk away from the beach (and no streets to cross!) if you stay at this Fort Lauderdale three bedroom, two bathroom beach home. A full kitchen, satellite television and laundry facilities are provided as well as a large living area and all the other amenities needed to make you feel right at home for just $249 per night. If you’re looking to escape the brutal winter weather in your state, anytime between December and April is the best time to visit Fort Lauderdale when the enviable temperature averages between the high 50s and low 80s. The hotter summer months are the best time to visit Fort Lauderdale if you’re on a budget. Summer and fall are the rainy seasons in Fort Lauderdale and the official hurricane season lasts from June 1 to November 30. There always something happening in Fort Lauderdale, and the following are just a small sampling of what you’ll find during your visit. Swimwear: With a swimming pool in almost every backyard and loads of water sports available in and around Fort Lauderdale, be sure to take some stylish swimwear. Sunglasses: With so many sunny days a year, be sure to take some fashionable sunglasses with good UV protection for your daytime excursions around Fort Lauderdale. A light jacket: Although the weather is mild, it can still get chilly during the winter months so include a light jacket. Comfortable footwear. Nothing can spoil a visit to Fort Lauderdale faster than sore feet, so make sure you pack comfortable shoes for your sightseeing adventures. Luggage and accessories: If you’re flying to Fort Lauderdale, make certain you find the right kind of luggage that allows you to pack as much as possible to avoid extra airline baggage fees. Vitamins and supplements: A long day of partying can take a lot out of you, so also be sure to stock up on vitamins and health supplements so you can enjoy your visit to the fullest. You don’t have to get an early start, but it helps if you want to pack as much every day as possible. The sample itinerary below can be easily modified, though, depending on when you want to get started. 10:15 a.m. – 2:00 p.m. Beachside bar crawl. 7:00 p.m. – 9:00 p.m. Enjoy the show at LeBoy. 9:00 p.m. – 11:00 p.m. Pizza and drinks at Louie Bossi’s Ristorante Bar and Pizzeria. 11:00 p.m. – ? Swimming and relaxing by the swimming pool. You and your bachelorette party guests will appreciate a bachelorette party t-shirt as souvenirs. Customized bachelorette party t-shirts are highly affordable and you can use your own pictures or stock pictures at your preference. Have some tips, recommendations, or feedback from your trip to Fort Lauderdale? Planning a trip and had a few questions? Please leave any comments you have in our Fort Lauderdale bachelorette forum dedicated to bachelorettes who are planning their ladies weekend in Fort Lauderdale. 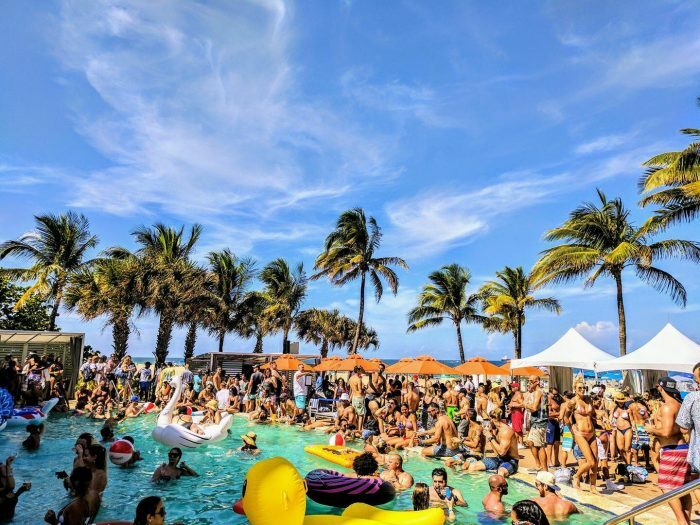 Besides the great weather and friendly people, civic leaders in Fort Lauderdale have made major investments in changing the popular stereotype of their city as just a spring break destination that appeals to young people. In fact, the city’s 23 miles of now-pristine rejuvenated beaches which have been honored with national Blue Wave Beach certification as among the safest, cleanest, and user-friendly beaches in the country which are a far cry from the beer-can littered image that many people think of when it comes to Fort Lauderdale. The Fort Lauderdale area also has more than 300 miles of navigable waterways in the form of creeks, rivers and canals and it is not surprising that city residents have more docks than driveways. Nevertheless, the city still suffers from a relatively high crime rate that is more than twice the national average so stay safe and travel in groups. We give Fort Lauderdale 4.5 stars out of 5 as a bachelorette party destination. We hope you found this brief guide to bachelorette parties in Fort Lauderdale helpful and informative. 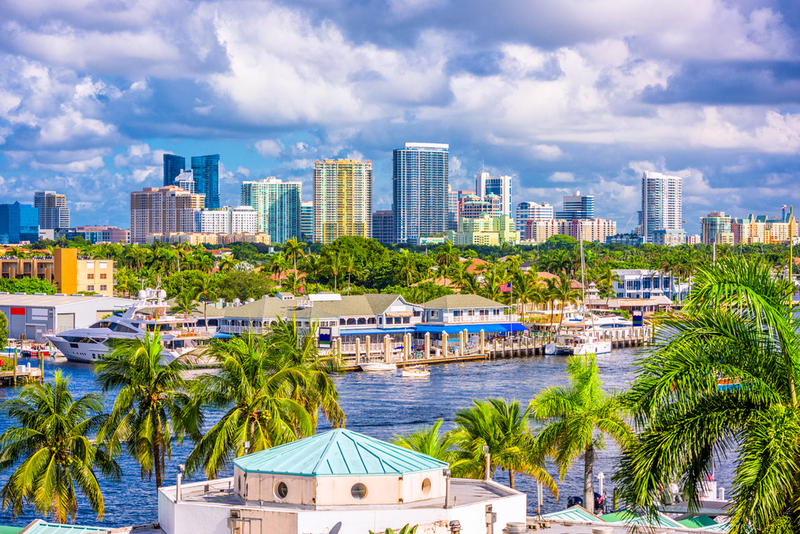 As the guide made clear, there is plenty to do and see in Fort Lauderdale that will appeal to any taste and budget, and the entire city is geared up for tourists with numerous shopping opportunities, a great nightlife and some of the best beachfront eateries around. In addition, Fort Lauderdale is also surrounded by other cities that offer numerous tourist attractions and entertainment so you’ll probably run out of time and money before you run out of fun things to do for your bachelorette party.